Longueuil is a city in the province of Quebec. It is the seat of the Montérégie administrative region and the central city of the urban agglomeration of Longueuil. It sits on the south shore of the Saint Lawrence River directly across from Montreal. The population as of the Canada 2016 Census totalled 239,700, making it Montreal's second largest suburb, the fifth most populous city in Quebec and twentieth largest in Canada. The Longueuil flag has proportions of 1:2 and a field of white. In the centre is the city signature, longueuil in blue san-serif letters above two waves of yellow and blue. The blue wave stems from the “g”, while the yellow wave crosses the lower loop of the “g”. The signature represents the characteristic traits of this dynamic municipality located on the south shore of the Saint Lawrence River...The chosen typography represents dignity and distinction. The two “l” letters at the extremities give the signature a balance that is also an inherent characteristic of life in Longueuil. Blue symbolizes the serene character of life in Longueuil and the proximity of the Saint Lawrence River. The undulating ochre wave immediately below the city name symbolizes the wealth from agricultural lands occupying a third of the city’s territory. The curve on the wave represents the characteristic outline of Mount Saint-Bruno and the river shores. The blue wave underscores the important contribution of the Saint Lawrence River to the development of the area known as the South Shore. Welded to the letter “g” of the city name, it confirms the unique tie between the municipality and the river by evoking the shore. Adopted by the municipal council in June 2002. For more formal uses, the Ville de Longueuil in 2002 applied for a grant of arms and a flag. On 10 May 2004 the Canadian Heraldic Authority granted it the arms of Charles Le Moyne, who founded Longueuil in 1657. The flag is a banner of those arms, in proportions of 3:4, divided horizontally red over blue, the red two-fifths the height of the flag. On the red stripe is a crescent, 120 Canadian City Flags points upward, flanked by two five-pointed stars, all in golden yellow. On the blue stripe are three heraldic roses in golden yellow, set two over one. On May 10, 2004, the Chief Herald of Canada, Robert Douglas Watt, granted the coat of arms to the Ville de Longueuil. The insignia are registered in Volume IV, page 372 of the Public Register of Arms, Badges and Flags of Canada to be borne and used in perpetuity by the Ville de Longueuil, in accordance with the heraldic rights of Canada. The coat of arms with crest and supporters, are those of Charles Le Moyne (1626-1685), who founded Longueuil and was knighted in 1668. In 2002, the late Raymond Grant, a descendant of the Le Moyne family on his mother's side, and the eleventh Baron of Longueuil, said that he was delighted to learn that Longueuil wished to officially take over Charles Le Moyne's historic coat of arms. In the absence of the 1668 letters patent of nobility, that have long been lost, Ville de Longueuil used a historic document written in the 18th century that provided a written description of the coat of arms (Paris, B.n.F., Chérin 138, dossier 2844). The full coat of arms is those of the founder and his family. Although it has now been granted to the Ville de Longueuil, the full coat of arms is not generally used. It serves as a historic reference. Only the emblems on the shield are used. The former flag of Longueuil used until 2002 centres the city logo, two-thirds of the height of the flag, on a white field of 1:2 proportions. The logo consists of two nested “L” shapes of light blue and light green, with a third pointed-oval shape in light green nested at the upper right. It is square-shaped, with rounded corners at the upper left and lower right. Below the logo and running its full width is LONGUEUIL in black sans-serif letters. On 1 February 1967 the city council of Longueil adopted a flag in proportions of 1:2, the right half white, bearing a blue fleur-de-lis; the left half red with a white cross, bearing in the upper left a white rose with blue details and the lower right a white maple leaf, more realistic than Canada’s, with 17 points. 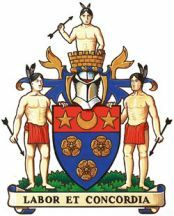 It is said that the full coat of arms serve as a historical reference point, and that the city uses only the shield and motto. Symbolism: The full achievement of arms, with a crest and supporters, are those of Charles Le Moyne (1626-1685), the founder of Longueuil who was ennobled in 1668 and whose son and namesake was created a baron in 1700 by Louis XIV. In 2002, Raymond Grant, a descendant of the Le Moyne family through the female line and Baron of Longueuil, expressed his concurrence with the proposal that the Ville de Longueuil wished to be officially granted the historical arms of Charles Le Moyne. In the depiction of the arms, the three symbols in chief (the crescent and the two stars) are coloured gold (yellow). Since the letters of nobility of 1668 have been lost, the city based its choice on a historical document of the XVIIIth century recording the blazon (written description) of the arms (Paris, B.n.F., Chérin 138, dossier 2844). Other versions of the arms show the three upper symbols as Argent (white). The flag of the Police force of the city of Longueuil is simply the police badge (containing the municipal arms) on a white field. The image is based on a photograph taken during a press conference.